The park main attractions are: Snorkeling at the coral reef, considered one of the most beautiful reefs of the world with a maximum depth of 12 feet and about 1000 feet long; kayaks, hammocks, salt water pool, the lighthouse, walk to the Mayan Ruins and Sculpture Park, as well as the fun shopping tours to downtown Isla Mujeres. 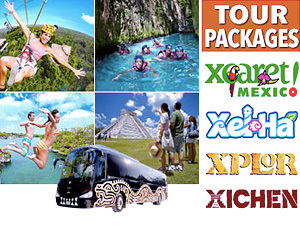 Explore Isla Mujeres on a complementary shopping tour of the island! Enjoy full access to Garrafon VIP, a new area designed to provide an experience of comfort and quality in luxury goods. With the VIP service you will receive personalized service in an exclusive section of this amazing paradise, where you can enjoy an international buffet menu with sushi, sashimi, salmon and many other delicious entrees. If you are traveling with small children or others who prefer to remain in shallow water, then this package is perfect for you. The Dolphin Encounter takes place in our dolphin habitat, but does not require swimming. You will learn about dolphins while having lots of fun interacting with them in our gorgeous surroundings. Kids must swim with a paying adult as a companion. Duration: 15 min briefing and 40 min in the water. This program gets you into the water with a dolphin that will make you shake hands, get a kiss and a song, snorkel together, and go for a ride on the dolphins belly. Kids (minimum age of 8 years old) must swim with a paying adult as a companion. This program is best defined by the words action and speed. It is the most dynamic of all swim with dolphins programs. Dolphins will conquer your heart before you even get into the water. They will give you a handshake, kisses and will push your feet to raise you up the water surface; you will feel like you are flying! SCHEDULE: Daily except Saturday at 10:30 AM and 3:30 PM from Playa Langosta (Boulevard Kukulcan Km 5 in the Cancun Hotel Zone) for the dolphin program at 10:30 AM and from Marina Aquatours Pier at Km 6.5 of the Cancun Hotel Zone for the dolphin program at 3:30 PM. Duration of tour: Approximately 8 hours. Ferry returns at 5:30 PM at Playa Langosta. Round trip ferry transportation between Cancun and Isla Mujeres from the ferry pier in Cancun. The Dolphin Swim program of your choice. VIP Lounge for adults includes international open bar for Royal Garrafon VIP. VIP International buffet cuisine for Royal Garrafon VIP. Buffet Lunch and Domestic open bar for Royal Garrafon. Photos of your experience with the dolphins. 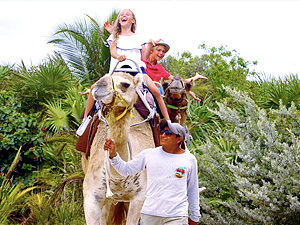 In Isla Mujeres, groups have a maximum of 20 people. The use of a safety vest is required for some Garrafón water programs. The use of life jackets is mandatory for aquatic programs.